As we researched places to stay in Istanbul, I panicked that Turkey was going to be much more expensive than we had originally planned. Hotels were pricey and private rooms at hostels weren't any better. Even Airbnb, our trusted source for cheap accommodations, initially let us down. We eventually found a nice apartment in Istanbul, but it was a little more than we hoped to spend. Fortunately, as we traveled outside of Istanbul, we found terrific values in accommodations, transportation and meals. We traveled to Turkey in early November, which signaled the start of the off-season for most of the areas we visited. Because of this, many things were closed, but those that were open were willing to offer special rates far below what we would have paid in high season. Even with splurging on a few meals (even room service one night! ), hotels and experiences, we still came in under our $125 per day budget. In a little over two weeks, we traveled from Istanbul along the west coast of Turkey, eventually ending in Antalya on the southern coast. Our itinerary had us doing some unique Turkish things in Istanbul, seeing the amazing Roman ruins in Ephesus, relaxing marina-side in Fetihye and settling near the ocean and the mountains in the little tucked away village of Cirali. It was a great way to see a mix of life in Turkey and the weather held up to the point where we could even swim in the Mediterranean. We spent $1,880 during 16 days in Turkey for a per day average of $117. Including our long-distance, inter-country travel and visas, we spent a grand total of $2,250 to visit four different areas in Turkey. It would be easier to get by on even less in Turkey, but since it was our second to last country, we took the opportunity to indulge a bit and opted for comfort over convenience. A note on Turkish visas - citizens of most countries will need a visa to enter Turkey. You can complete an online e-visa application if you have time or you can buy a visa stamp upon arrival at the airport before going through immigration (which was really easy and took hardly any extra time when we landed). Make sure to bring cash in your country’s denomination ($20 USD per person for example) because they will ask for the payment according to the country passport you present. This is the first country where we spent more time in hotels than other types of lodging. In fact, when we arrived at our newer, modern hotel in Fethiye I immediately commented that I couldn’t remember the last time we had actually stayed in a real hotel, with a real hotel bed and bathroom. Come to remember, it was at the end of July! Since we were traveling during the start of their off-season, we got incredible deals and had most places to ourselves the entire two weeks. We had this lounge all to ourselves at Homeros Pension in Selcuk. We started out LOVING the food in Turkey (here is Dave's first take on it). In Istanbul we had a few great meals between local kebab restaurants and our favorite spot, Antiochia. Then we continued traveling and soon realized it was about the only types of meals we would find. While I love me a good lamb donor sandwich for $2-3, by day 15 I was really ready to eat something else. 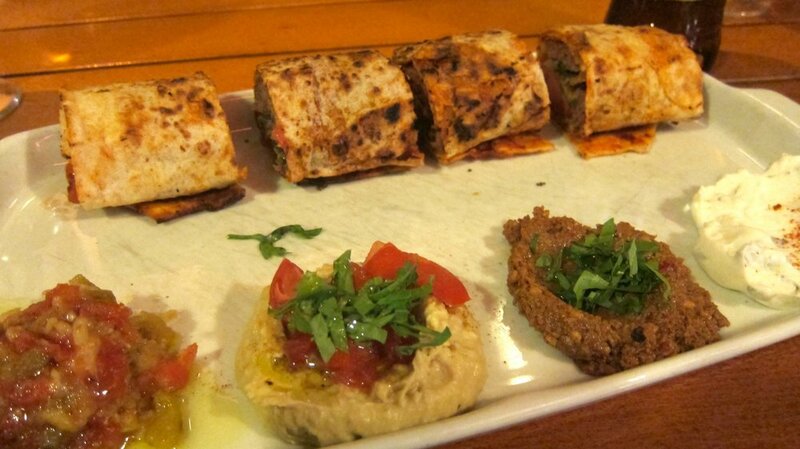 Meze and a wrap at Antiochia. Eating in Turkey can be incredibly inexpensive as long as you stay clear of the high end restaurants in Istanbul. Many restaurants we ate at also didn’t serve alcohol (especially the kebab places) so we saved money by not being tempted to have a beer with our dinner. Overall, alcohol is expensive and lacks any real variety in Turkey so we gave our livers a much needed break. Oh, and the best baklava in Istanbul is at Karakoy Gulluoglu. Go immediately! One of the best things about lodging in Turkey is that most accommodations include breakfast. We had breakfast included in every place we stayed, including our Airbnb apartment rental. While cheese, olives, fresh bread and eggs got a little repetitive, I was happy to not have to worry about that particular meal for two weeks. 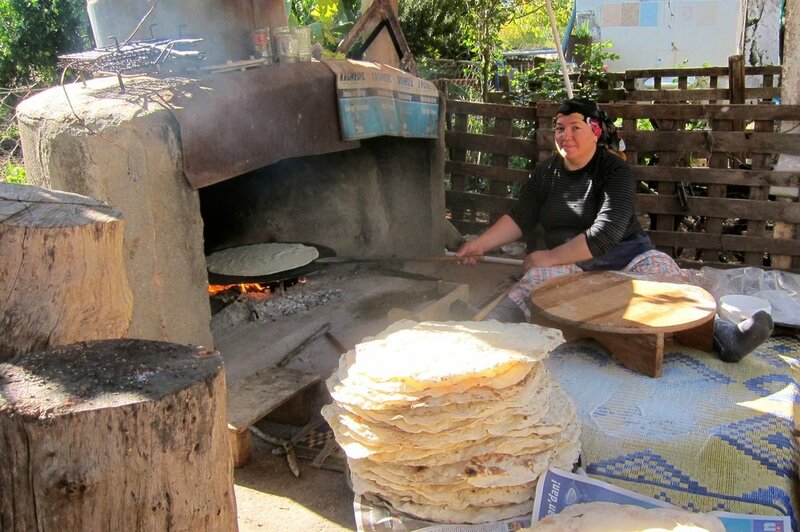 Our cheapest meal was a flatbread and olive oil lunch in a woman’s backyard while we hiked from Fethiye to Kayakoy. For $1, she fed us all the flatbread we could eat and got a kick out of us watching her roll out flatbread after flatbread. We got waved into her yard after she noticed Dave salivating while watching her make them from afar. Our flatbread making friend near Kayakoy. Traveling in Turkey is really amazing and probably ranks as one of my top countries to travel through. It is inexpensive and it seems that the local airline and bus companies have thought of everything to make traveling as seamless as possible. Flights - We flew Atlasjet, a Turkish budget airline, twice during our time in Turkey. Our first flight was from Istanbul to Izmir where we were eventually trying to get an hour south to the town of Selcuk. Atlasjet checked our luggage for free, gave us an in-flight sandwich and had a free shuttle to Selcuk upon arrival in Izmir. Having booked our tickets a couple of weeks in advance, we paid a total of $78 for two tickets. Really incredible - I have no idea how they make any money. Onuair, another Turkish airline, also operates free shuttles. If you are flying in and out of Istanbul, I highly recommend booking with airlines that fly to Ataturk, the main international airport given its easy public transportation links into the center of Istanbul. Buses - Bus transportation in Turkey is also easy as pie if you can get past some initial harassment from all the bus company hawks as you approach the bus terminal. I would recommend asking your hotel staff for the best companies to go through given your route so you can directly head to the booth you need. The bigger, long-distance buses in Turkey are really comfortable and some offer free Wifi, television screens on the back of the seats and free coffee/tea. The major bus lines also offer free shuttles into the city center when you arrive at your station since most of the major bus stations are a little ways outside the center of the city. The bus representatives will usher you to the right place! A typical line up of buses at a Turkish bus station. Dolmus (or minibuses) - The dolmus is a small minibus that Turkish people use to get around town and in between towns that aren’t serviced by larger buses. It is easy to flag any dolmus down in the direction you are headed and they will get you close to where you need to be. They are typically cheap at just a few lira each and you pay the driver either as you get on or off. The Turkish countryside is really beautiful and I loved being a passenger on a bus watching the mountains roll by. After leaving Turkey and rounding out 10 months on the road, we had spent $37,443 in 308 days for an average per day cost of $121. Adding in major flight, long-haul transportation and visas, our grand total thus far is $42,201. Interested in how much it costs to travel to other places like Australia, Japan, New Zealand and Europe? You can find our other budget posts here.